PERL Coat by CarPro is a concentrated versatile water-based, protective coating for plastics, rubber, and leather that offers tremendous UV protection. 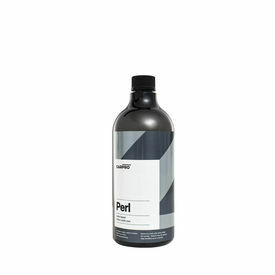 PERL Coat is a water based dilute to suit product, covering a large array of tasking within car care. It can be used to restores the like-new appearance of hard exterior plastic surfaces and keeps them looking good with strong UV and hydrophobic protection. The sun can be damaging on flexible materials, like rubber, plastic, and leather. Gradually & over the course of time they fade & become brittle and cracked. PERL Coat is changing the rules. PERL Coat provides excellent protection and lasts up to three months on interior and engine surfaces. Durability on Exterior Surfaces varies based on the type of plastic and the exposure in your environment. It can protect for up to 3 months on exterior surfaced as well however if you see constant rainy conditions the darkness will fade from some plastics and tires sooner. For a dedicated extremely long lasting Exterior Trim Coating please take a look at our 'CarPro DLux' product. Tires & Rubber: Undiluted~1:1 (I recomend 1:1) 2 thin coats with 20 minutes or more between will offer the best looking finish available.